The Burnley players will be reporting back for pre-season training next week for what will be the first time at the new training ground at Gawthorpe. The players moved into the new building towards the end of last season to help iron out any teething problems but now it can be used in earnest as we prepare for the 2017/18 season with the Clarets still in the Premier League. I was inside Ibrox Stadium, the home of Rangers, two years ago when the club confirmed the news that the council had approved the plans for the redevelopment of the site and that came just four days before the training ground could claim to be sixty years old. At the time, I wrote: “No longer do we have state of the art facilities although new pitches were added last season (2014/15) to add to the one created in 2005, and the better changing and gym facilities (added in 2011/12). At the time, we’d just been relegated and so it was a big financial commitment from the club and a fantastic legacy from our second Premier League season. Had we not gone up in 2014, I’m not sure this could have happened, but the subsequent promotion in 2016 even allowed for us to add on such as the new under soil heated pitch and a fourth Desso pitch which is currently being worked on. The new facility, and the ever changing academy, has also allowed us to successfully apply for EPPP Cat 2 which will now see our under-23, under-18 and under-16 teams play in the Professional Development League next season. 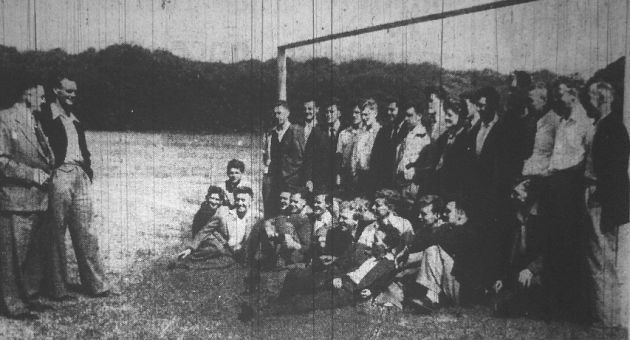 It’s a far cry from the days when we opened the training ground for the first ever time on 25th July 1955 when the players reported to Gawthorpe to begin pre-season training. Manager Alan Brown (pictured above with chairman Bob Lord welcoming the players back for pre-season) had a vision to have a training ground away from Turf Moor where the players could be properly coached and where we could bring in young players straight from school and help them progress to become first team players. Brown was very much a modern style of coach; today we would probably suggest he was ahead of his time. He had a massive influence on Brian Clough, who he later coached at Sunderland, and, of course, in turn, Clough was a massive influence on our current manager Sean Dyche. So it seems very appropriate that Dyche is the man in charge as Brown’s dream has been given the upgrade that has been needed for so long.